I'm proud of my classroom rules this year. I've always enlisted the kids' help coming up with a set of rules, but I always "guide" them to include rules that I feel are important (and I think it would be irresponsible not to!) but I would also omit those rules that I thought were redundant. Well, this year I rethought that system. My principal is really into Responsive Classroom. And though I've always worked on explicitly teaching social skills, he makes me think about it even more. 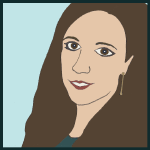 I wondered, "if a student brings up a rule, why should I call it redundant? Who is this list of rules REALLY for?" Maybe if a child requests a written reminder for a rule like, "Don't sharpen your pencil with scissors," I need to give that to him! Same sort of thing as the first draft of our rules every year. But this time I thought to myself, "How did I originally create my set of rules for the class?" And the answer dawned on me! I looked for main ideas; EXACTLY the skill that I always find so hard to teach my fourth graders! This was going to be the perfect teachable moment. and a 5th category of "Misc." Which was related to respect for things, as opposed to people, but for my class I felt like allowing a misc category when trying to organize is a lifelong skill so I kept it. With the rules paper clipped into groups, I gave each group of students a set, and told them they needed to see if they could find one strip that had all the other rules inside it. If not, they had to make their own. Especially with a group that was coming off a summer vacation lull. They were out of practice when it came to discussing their ideas in a small group, respectfully disagreeing, and so on. I made a mental note of where things fell apart for Morning Meeting tomorrow, because it didn't get TOO heated. And except for the "noise control" set (which the kids gave an overly general label of "Don't be Disrespectful,") they did a good job coming up with topics. I gave them their props, but let them know we'd come back to that 1 poster tomorrow to rethink the "title." I remembered a trick the special education teacher told me for main idea, that I originally dismissed as being unrealistically simple (she's a good friend, so I can respectfully disagree with her!). She asks the children "What word do you see the most?" Well, in this case, the trick WORKS. In the majority of the rules on that poster, the word "talk" or "talking" appeared. So when I asked the kids which root word appeared 4 times out of 6 they got it right away. Within minutes of discussion about a "title" that uses "talk" in it, they got the idea that it was about volume and when they can talk. So we revised our poster. So now when I remind the kids of the rules, I make like we only have 4. Learn, Know How Loud and When to Talk, Respect Others, and Safety. As the year goes on, we'll talk about commands and turn "safety" into a rule that matches the others in structure. But for now, they get the message, and I didn't dismiss anyone's rule. 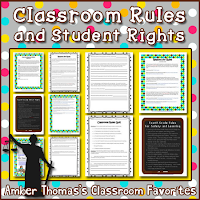 I update my Classroom Rules and Student Rights for my class each year. And it's editable if you need a framework to get you started. I LOVE this!! What a great way to get a head start teaching main idea/details! Funny coincidence; I was just contemplating taking these posters down today. Our last day is Wednesday so I rethought it. Too soon still to be "lawless," hehe.